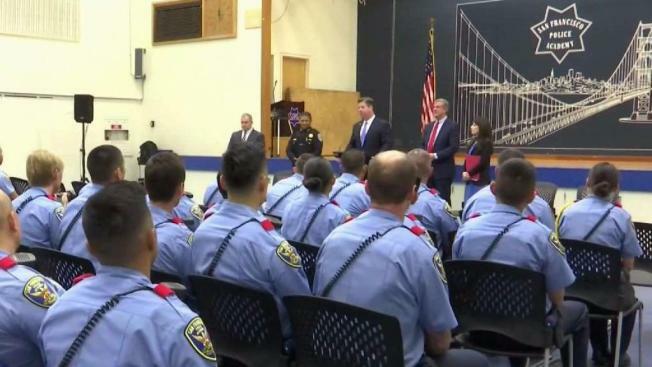 San Francisco Mayor Mark Farrell announced Tuesday the city's police department will add 250 sworn officers and invest in more reform efforts over the next four years. Farrell's $34.2 million plan to bolster public safety also includes funding for new vehicles and equipment for the police department, according to a news release from the mayor's office. Under the mayor's hiring plan, 130 new officers will enter the police academy in the next fiscal year. "Public safety has always been my top priority as Mayor. I am following through on my commitment to add additional officers to neighborhoods across San Francisco," Farrell said. The plan also includes $1.7 million for police reform measures and community engagement initiatives and $3 million to equip all officers with Tasers. The additional officers will increase citywide foot patrols, add investigation teams at stations to allow for seven-day staffing and expand the burglary and serial crime units, according to the plan. The plan also addresses SFPD's ongoing reform efforts, particularly those related to use of force, the mayor's office said. Officials lauded the mayor's move Tuesday. "Strategic and fair policing require highly trained officers with the necessary equipment to address the issues impacting our city and making our streets safe for our residents and visitors," Police Commission President Thomas Mazzucco said. "I applaud Mayor Farrell’s initiative to fully staff our police force," Supervisor Jeff Sheehy said. "These additional officers will enable us to turn the corner on property crime and make all of our residents safer."